Bromley-by-Bow is the Underground's 73rd step-free station. 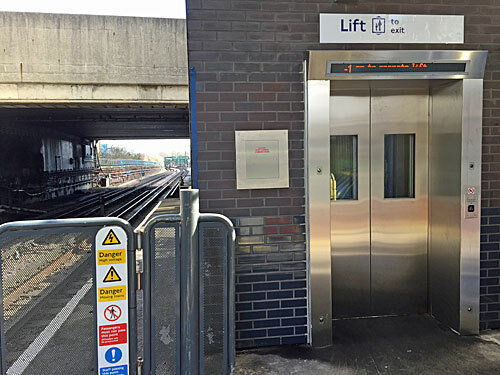 It's taken ages - planning permission was agreed three years ago - but this week we finally have lifts. 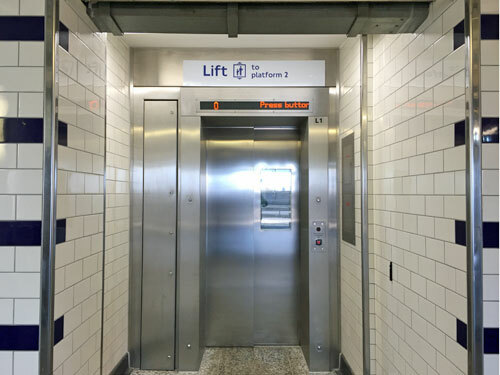 One lift faces the main entrance, and leads down to the eastbound platform. The upper entrance is through a short attractively glazed passage. Due to the constraints of the site, the lift isn't especially big. It can hold 13 persons. You exit on the opposite side to the way you came in. I've already seen a happy mother with a pushchair taking advantage. The other lift is at the far end of the footbridge, and leads down to the westbound platform. It's almost twice the size inside, and can hold 21 persons. It descends to the very far end of the platform, where passengers alighting from trains might never notice it. A few 'Lift' stickers have been stuck around the platforms to try to make it more obvious. Although the exterior looks like bricks, it's actually thin sheets of cladding stuck on to look like bricks. The very top of the lift towers includes a subtle triangular pattern using glazed and unglazed 'bricks', which adds a bit of interest. All of this is part of a major redevelopment of the station to help cope with the several thousand new homes being built in the area. 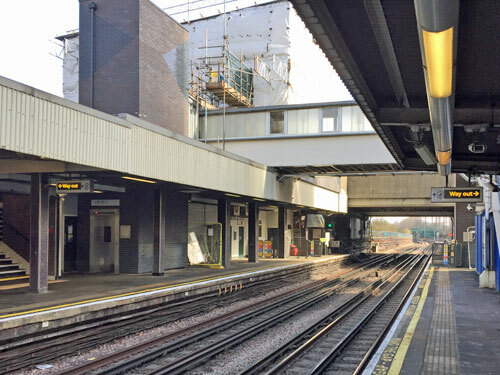 The ticket hall is currently under scaffolding while a new 'lantern' is built above, making the grotty 1972-style entrance a lot more welcoming. All the planning notices are here, if you're interested, and the architect's project page is here. 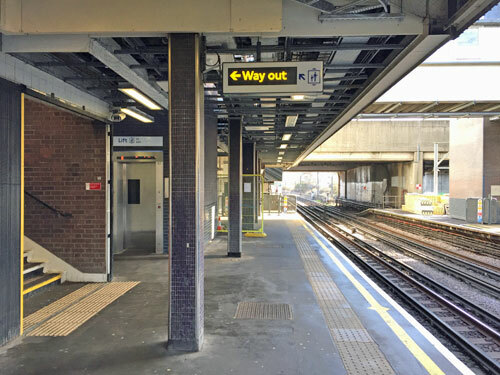 Eventually Bromley-by-Bow will be getting its ticket barriers back, so passengers won't be able to go for free rides like a lot of them do at the moment. Perhaps we'll even see a member of staff in the ticket hall again, or maybe that's hoping for too much at this most disregarded of stations. It's not like TfL to keep silent about successes like this, so maybe the congratulatory press release is being held back until Sadiq can find a spare morning to cut a ribbon. But for now, rejoice that the tube has another step-free station, on the long slow road to transport accessibility.